The Office of Digital Learning had an initial meeting last week that brought together faculty from the College, the Institute, the Language Schools, and Schools Abroad, as well as administrators to discuss opportunities for coordination and connection between programs. The goal of this meeting was to explore collaboration and cooperation opportunities across our diverse Portuguese programs, and to dive deeper into a few specific opportunities we identified in a web-based meeting held in February 2017. The meeting was a great opportunity to discuss immediately-actionable steps as well as strategic collaborations that will require longer-term planning and additional resources. Moving forward, the Office of Digital Learning will be helping to plan a web-based hub for highlighting Portuguese-related programs across the institution and bringing visibility to the exciting work students do in our programs. Many participants were in Vermont for the meeting, but several attended remotely via Zoom. Last week, Grassroots Social Action Teams led by Bread Loaf-connected community mentors and young people from Lawrence, MA; Atlanta; rural South Carolina; Louisville, KY; Vermont; and Navajo communities met at the BLSE’s Ripton VT campus for a planning session to launch BLTN’s Next Generation Leadership Network. 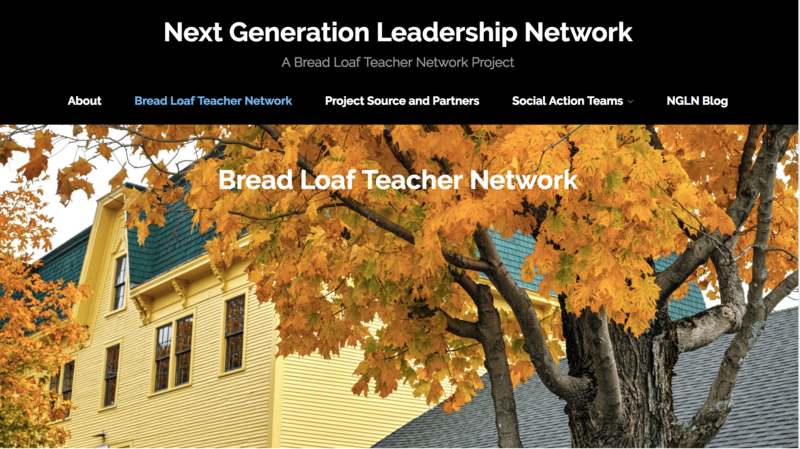 The Next Generation Leadership Network is a special project of the Bread Loaf Teacher Network at the Middlebury Bread Loaf School of English. The project is supported by the Ford Foundation’s Youth Opportunity and Learning program. The Office of Digital Learning gladly collaborated in the construction of their digital spaces and we invite you to learn more about the project here.